Finally, a protein/nutrient rich snack that will satisfy your sweet tooth while staying away from cane sugar. Begin by heating frozen berries in microwave until able to mash them into a syrup. 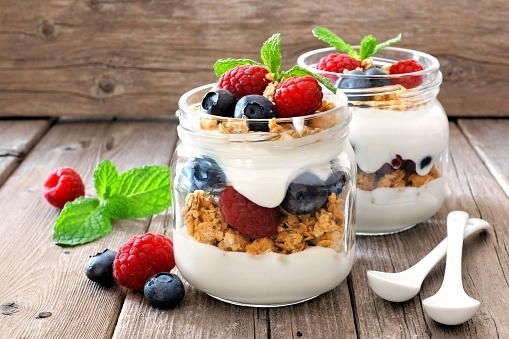 Combine greek yogurt, berry syrup and granola into snack sized bowl and stir. Top with a dash of cinnamon and boom, a healthy snack in under 5 minutes! Frozen berries and granola are easily interchangeable to satisfy pallet. Enjoy!